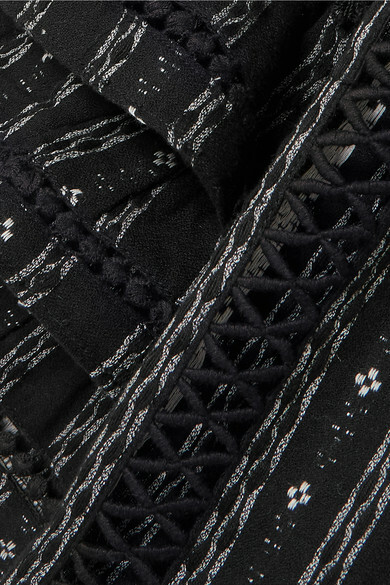 The unique embroidery on Dodo Bar Or's top is inspired by Middle Eastern architecture. Made from breezy cotton-jacquard, it has tiered, ruffled sleeves that are emphasized by delicate tassels and features pretty crocheted trims that show off just enough skin. Balance the loose fit by tucking it into the matching mini skirt. Shown here with: Cult Gaia Tote, ATP Atelier Sandals, Alighieri Bracelet, Alighieri Bracelet, Tohum Bracelet, Kenneth Jay Lane Anklets, Leigh Miller Earrings.